LI 700 Non-ionic Surfactant is a premium soy-oil derived, non-ionic penetrating surfactant, which reduces off-target spray drift, and reduces spray water pH.Contains LECI-TECH chemistry. LI 700 Non-ionic Surfactant is a premium soy-oil derived, non-ionic penetrating surfactant, which reduces off-target spray drift, and reduces spray water pH. 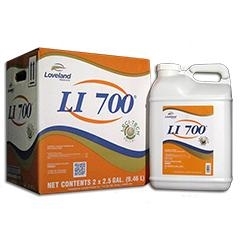 Unique formulation technology and quality ingredients separate LI 700 from the imitators. Contains LECI-TECH chemistry. LI 700 surfactant properties improve spray droplet deposition, adhesion and coverage of spray material on leaf surfaces. Penetrant properties maximize the effectiveness of systemic herbicides, insecticides, fungicides, miticides, PGR's and foliar applied nutrients. Acidification properties prevent degradation of pesticide caused by high pH water. Drift reduction properties of LI 700 lower potential for off-target spray and improves deposition of spray droplets. Soy-oil derived components in LI 700 provide excellent crop safety and replaces petroleum-based components with farm-grown components. LI 700 is a low-foaming surfactant and will not cause foam problems in the spray tank.